Governor Malloy is a big hockey fan, so I closed out this week’s Face the State with a flashback chosen with him in mind. We look back at 1986, when Hartford hosted the NHL All-Star game and Whalers fever hit Connecticut because of the team’s unprecedented, albeit unsuccessful run for the Stanley Cup. 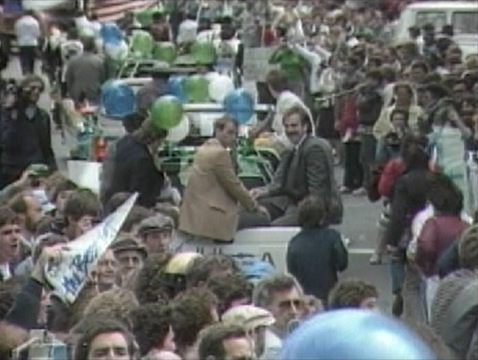 Even though the Whalers lost in the playoffs, the team was honored with a big parade through Downtown Hartford. 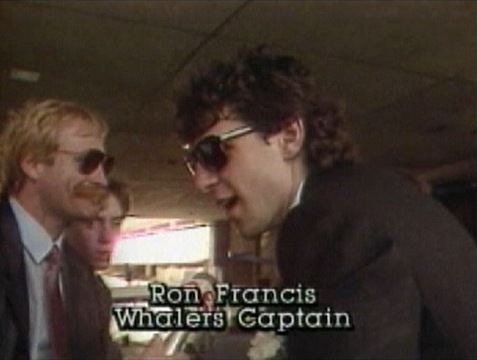 In the vintage video we dug up for Sunday, you’ll hear from Ron Francis and some other players, and marvel at the enthusiasm the fans showed. 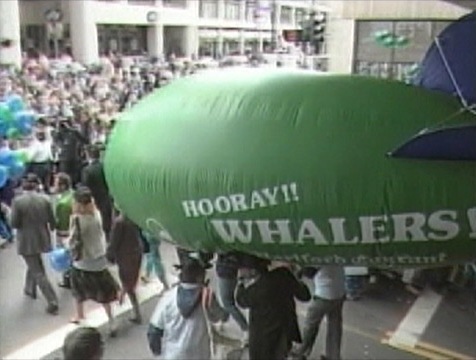 Whalers merchandise was a big seller, even churches got into the act. You’ll hear the historic Christ Cathedral in downtown Hartford playing the Whalers fight song Brass Bonanza on its tower bells. The crowd at Bradley Airport to greet the team was pretty remarkable to watch. The report was filed by Gayle King in May of ’86. So, can scenes like this be repeated? Governor Malloy smiled broadly as he watched the 27 year old video, and then we talked about whether major leagues sports can be restored in Connecticut’s capital city. While urging caution, the governor told me there are two groups interested in buying a team and perhaps moving it to Hartford. He wouldn’t elaborate, but did say if these groups are serious and show him the money, then he would do everything within reason to help bring a team here, and he discussed the role of the XL Center in this and its new management team. The governor told me bringing back the Whalers would be “a unifying force in the state.” He also brought up some interesting food for thought: a team in Hartford could be good for the NHL by reducing costs. Travel for teams between Hartford, New York and Boston would be bus travel and cheaper than a plane. It’s clear the governor has done his homework on this subject. Will the show then be posted online for us CT natives who now live out of state? Well Gov. you weren’t so go back to trying to give our tax money to the worlds largest hedge fund, keep pretending you’re about the people…lol please. if he’s for real then let’s get them back. Hartford has absolutely NOTHING ELSE. Neither does this state for that matter. I’ll never go back is the vacation motto. Bring ’em (whalers) back! 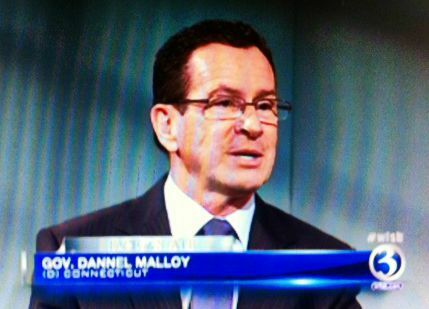 Typical of Malloy don’t let the facts get in the way of “blaming Rowland/Rell”! !! The facts show that it was WEICKER’s hand picked (CDA held the loans therefore state had final say over whom it would sell the Whalers to) owner Peter Karmanos who after Lt Gov. Rell lead a campaign to build season ticket base that was larger than most other NHL teams he moved the team anyway. Out of this Weicker got a lucrative seat on Karmanos company’s board of directors that paid him thousands! But the Courant and the rest of the media who were in love with Weicker never reported it to this day! Despite all the details in the past, I am so happy the Whalers are back as they remind me of great times watching them at the Civic Center when I was back at Avon High in the 80’s! Does ANYONE believe ANYTHING this narcissistic commie says anymore? I’m disappointed that DH didn’t call Malloy on this whopper. John C’s comment above explains it all. Malloy would have been POWERLESS to stop Peter Karamanos from moving the team to NC and he knows it. In future, please don’t let this Democrat blowhard make irresponsible and factually incorrect statements like this. It just caters to his monumental ego and encourages him to make even more egregious statements. Here’s a suggestion: Invite him to come on your show and ask him to explain how he’s going to move CT from the highest per-capita debt to, say, perhaps the 5th highest (little steps at first). Or, how he’s going to do something truly fundamental and necessary to make CT more attractive to businesses and families – like reducing our collective state taxes from the 2nd worst in the nation to, say, something nearer the average for all states. Go ahead and ask him, and don’t let him tell any more of his infamous lies if he agrees to come on.